Assorted forks. Frae left tae richt: dessert fork, relish fork, salad fork, dinner fork, cauld cuts fork, servin fork, carvin fork. 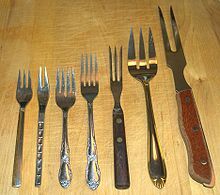 As a piece o cutlery or kitchenware, a fork is a tuil consistin o a haundle wi several narrow tines on ane end. The fork as an eatin utensil haes been a featur primarily o the Wast, whauras in East Asie chopsticks hae been mair prevalent. The day, forks are increasingly available throughoot East Asie. This page wis last eeditit on 31 Mey 2018, at 02:51.